'Clicky' is the word that best describes Torchlight II. Make no mistake, it's a frenetic click-fest the likes of which even Diablo III can't match. Non-stop action with engaging characters, giant maps and a never-ending supply of baddies and quests. 'Clicky' is the word that best describes Torchlight II. Make no mistake, it's a frenetic click-fest the likes of which even Diablo III can't match. (And there's my inevitable comparison to Diablo.) But it's also very easy to click with Torchlight. It's an engaging, accessible and easy to play game. Having said that, there's challenge aplenty for those looking for a tougher game. You play one of four character types - engineer, berserker, embermage or outlander - as you run around giant maps, thwacking baddies and helping people out on tiny, smallscale, medium, large, and bumper-funsize quests. There's one main quest, but to be honest, there are so many sidequests that it's alarmingly easy to lose track of it. Torchlight II is not exactly an epic RPG, but it falls roughly into that genre, with a modicum of dungeon-bash and a slice of steampunk aesthetic. As with most RPGs, you level up frequently, assigning stat points and skills to your character to develop them. There's a good variety of builds that it's possible to develop - except as an embermage, where you'll find things tough going unless you stick to a few set archetypes. I particularly liked the engineer, with their ability to create robot assistants and their tendency to smack everything that moves with a heavy mallet. I also liked that each character has a pet to assist them. You can set your pet to attack everything, play defensively, or stay well back, and you can give them special powers by feeding them fish that you catch at special fishing holes. I swear I'm not making this up. There's something creepily awesome about turning a little cartoony dino sidekick into an all-too-realistic tarantula for 15 minutes. The graphics are both fantastic and lighthearted - I swear at one point I was battling a horde of Dr Seuss' Lorax. Admittedly, my Lorax were considerably meaner than the good doctor's. In general, though, aside from those Lorax, many of the monsters blurred together. There was nothing especially noteworthy about their attacking style or appearance to make me remember them once the battle was over. Battle is fast-paced, whether you play on the delightfully easy 'casual' setting or the tough and occasionally heartstoppingly difficult 'veteran'. There's no easy way to just keep swinging your mallet (or alternate weapon), so you have to repeatedly click on the baddies. There's also no readily apparent way to macro or chain your attacks and skills to tackle a rare or boss creature, which is disappointing. I'd also like it if the various items - armour, weapons, outfits - were a little easier to identify on sight, but these are not dealbreakers. Honestly, the game is just plain fun: it's far too easy to sit down to play for five minutes and look up from your screen to find five hours have passed. 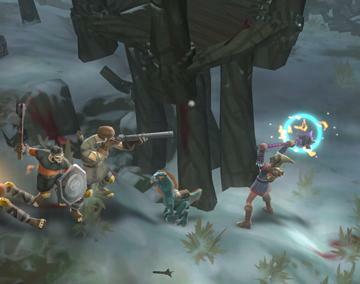 Torchlight II strings together missions, maps and monsters in a continuous stream that allows you to just immerse yourself. I'd almost forgotten how fantastic that feeling is. The only real downside, for me, was that the music and effects turned me from smiley, happy player into stabbity wild-eyed killer in about five minutes. They hit the wrong side of twangy, jangly, honky-tonk for me, but I turned the sound off and suffered no further ill effects. Co-op play is fun, whether you use LAN, a shared game or go crazy on the wild frontiers of the open games online. It's a little annoying to set up your Runic Games login, which takes you from Steam to web to Steam to email to Steam in order to complete, but once it's set up, things are simple and the shared games are plentiful. In all, Torchlight II is incredibly good value for the $20 you'll spend. Go get it.